Thank you Publix for fixing all of your lessess to fewers. 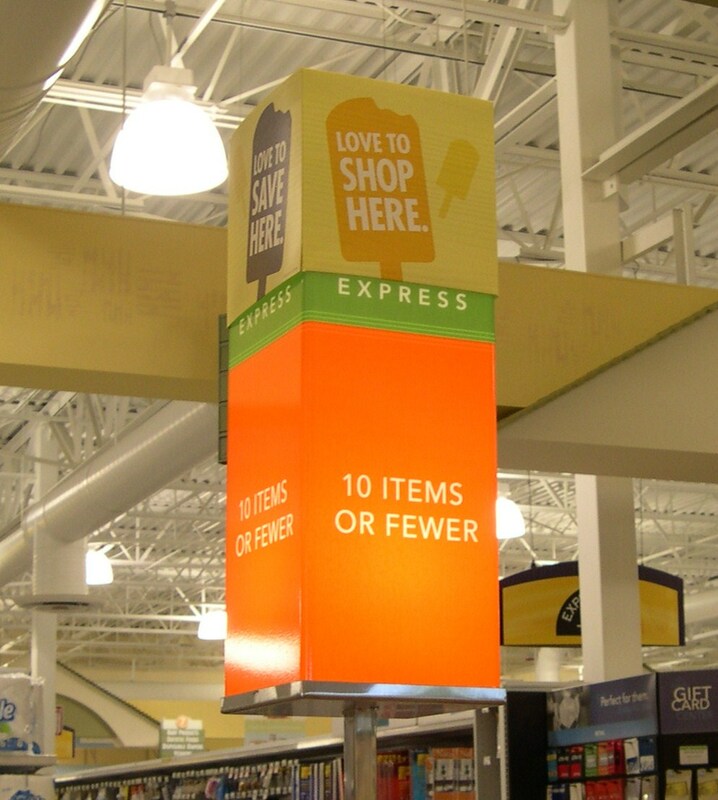 It is a step forward for all grammar kind. I felt pure joy when I saw these new signs. I looked at the people around me, and they were just counting their items to make sure they didn’t go over quota. I count mine too, and even have guilt when the eleventh item makes its way into my cart. Then there is always that poor soul who didn’t see the sign, and has placed sixty-five items on the conveyor belt thingy. We all know because not only do we count our items, but we also count the items in the cart in front of us. Again, this brings me to my thoughts on inquiry science and the manner in which instruction is changing. It happens, over time-even if it looks and sounds unfamiliar, like the cadence of fewer versus less. One of the last classes I took to complete my specialist degree was physical science. The class was inquiry based-or what I call McGyiver science. My professor insisted that we never give students the exact materials for an experiment that will guarantee the desired outcome. Science is about trial and error, acknowledging variables, and persevering. She asked us if we were expecting perfect results, or encouraging students to re-work hypotheses, collaborate, and discuss the work? It may turn out that the growth is in the mistake. That summer was complete with my ill constructed foam roller coaster that had neither a loop nor a hill, a defunct lemon battery, and toy cars breaking down because the load was too heavy. It reminded me of my home economics class where my decorated cake looked like abstract art, and my A-line skirt was used as an example of what can go wrong in sewing. The other day, I was faced with a vacuum cleaner and a bag. The vacuum mocks my inability to get the bag to ‘snap’ in. However, I did use that vacuum cleaner to fight a snake in my house-so I used what I had available. This year as a gifted teacher, I have focused on inquiry science with my 3rd graders. Part of teaching inquiry is letting your personal control freak go. The first step is to admit you are a control freak teacher. Then it is time to let go a little, and let the kids do the learning. Things are messy. Stuff spills. Students have odd ideas of what will and won’t work. They are determined that a pound of bricks weighs more than a pound of feathers. I will say that if you add duct tape to any classroom activity, you will have the undivided attention of your class. I don’t know why, but it is true. Of course, we had the discussion about DUCT tape vs DUCK tape. Asking questions is an art of sorts. I have been asking questions my entire life, and I now find myself teaching my students how to ask questions. If I were to get philosophical, I would say that we could use the Inquiry method to drive all our life choices. We are given some random supplies and a task to complete. We try to figure it out. If it doesn’t work, we change something and try again. Getting upset over a failed outcome doesn’t help anything. We have to figure out what went wrong. Sound familiar? We are challenged daily. The results of our efforts don’t always come out the way we expect, even if we use all of our supplies. 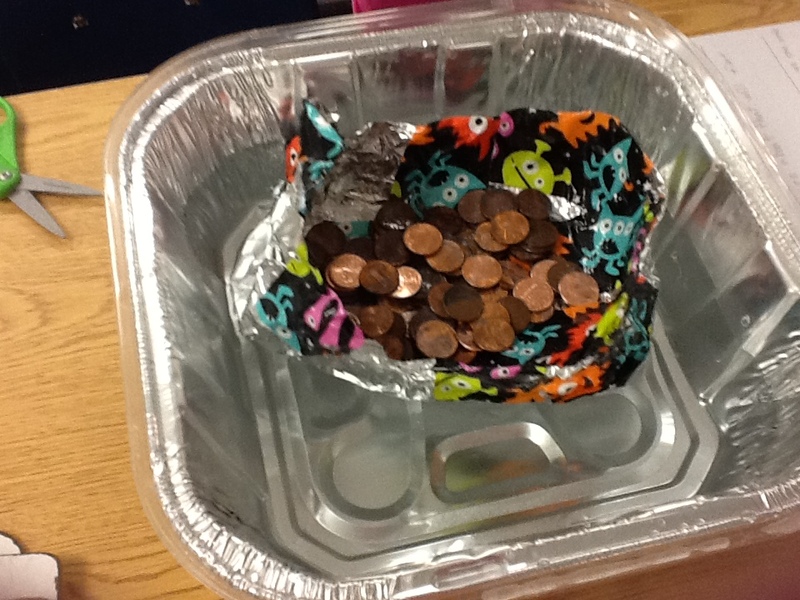 Design a boat that will float with 100 pennies. The 100 penny lab was a great one to start with. Kids were given duct tape, tin foil, 100 pennies, a pan full of water, and a task to design a boat that would float with all 100 pennies in it. I loved how these kids persevered until their boats floated. They were so excited, because THEY figured it out. So, I became a little zealous. The made duct-taped boats float, so they can build a bridge out of pasta! We will be revisiting that activity with stronger pasta. The kids did their own research on bridges that day. They told me what structures and shapes are stronger than others. They are re-designing the bridges for next week. To think-I was ready to scrap the entire thing because it didn’t work out the first time. The kids assumed we would be doing the pasta activity again. My students taught me my own lesson. Then I began to wonder how often I have scrapped something because it wasn’t turning out the way I wanted it to? We cannot teach without bringing these lessons home, because ultimately that is what we want our students to do. It is unlikely that a potential college or job will ask a candidate to build a pasta bridge. But, isn’t it about the perspectives in which we perceive our obstacles? And isn’t it great that eighteen third graders reminded me of this with their perseverance? Here’s to using all the materials available to me (even if they aren’t the ones I wanted).